Myanmar, formerly Burma, is a resource rich country in southeast Asia, bordering Bangladesh, India, China, Laos, and Thailand. The country of nearly 52 million people is going through a mammoth change these days. The old men of the military that ran the country for more than half a century have been displaced by a popular, elected, civilian government of National League for Democracy (NLD). Aung San Suu Kyi, the daughter of the founding father Aung San, is the de facto leader of the government with the title of the State Counsellor. The transition to democracy did not come that easy. Its path was stained with blood and sacrifice since 1962 when General Ne Win came to power through a military coup. Fifteen student protesters of the capital’s Rangoon University were killed. The country was ruled by a revolutionary council headed by the general. Almost all aspects of society (business, media, production) were nationalized or brought under government control under the Burmese Way to Socialism. As a result, the Rohingya people of Arakan state and the prosperous Indian Hindu-Muslim-Sikh business community of Rangoon became the worst sufferers in this experiment; many non-Buddhists were forced out of Burma. A new constitution of the Socialist Republic of the Union of Burma was adopted in 1974. Under the Burma Socialist Programme Party (BSPP) Burma became one of the world’s most impoverished countries. In May 1990, the SLORC government held free elections for the first time in almost 30 years and the NLD, the party of Aung San Suu Kyi, won nearly 80% of the seats. However, the military junta refused to cede power and continued to rule the nation as SLORC until 1997, and then as the State Peace and Development Council (SPDC) until its dissolution in March 2011. It was an attempt to rebrand the old order; the power remained with the junta. Then came the 2007 Saffron Revolution, a non-violence: national movement, led by Buddhist monks, which was violently suppressed. An international condemnation of this peaceful revolution led to further isolation of the government. A fraudulent election was held in 2010 in which the military-backed Union Solidarity and Development Party, declared victory winning nearly 80% seats. The military junta was replaced on 30 March 2011 by a quasi-military government, led by former General Thein Sein, with the goal of putting the country back to the path of democracy. Suu Kyi was released from house arrest and her party allowed to participate in the by-elections in 2012 in which it won 43 of the contested 45 seats. Then came the general election of 8 November 2015 in which the NLD won an absolute majority of the seats in both the houses. And the rest is history! Recently, Suu Kyi visited the USA and gave a speech at the UN General Assembly session. She was also awarded the Humanitarian of the Year award from Harvard. The question that begs an answer is: how was it possible for the military to rule this multi-ethnic, – racial, and –religious country for so many decades? What ideology boosted its credibility to rule almost unopposed for all those years? 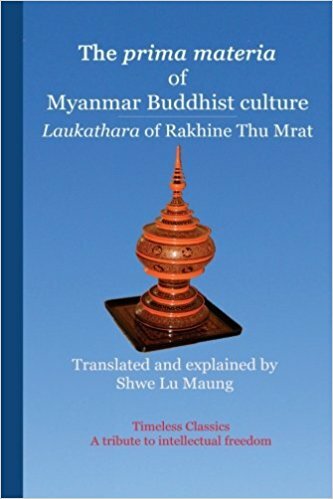 The answer is provided by Dr. Shwe Lu Maung (Shahnawaz Khan) in his latest book – The prima materia of Myanmar Buddhist Culture: Laukathara of Rakhine Thu Mrat, published in the USA by Shahnawaz Khan (2016). The author, a diaspora Burmese from Arakan (Rakhine), has been living in the USA for decades. 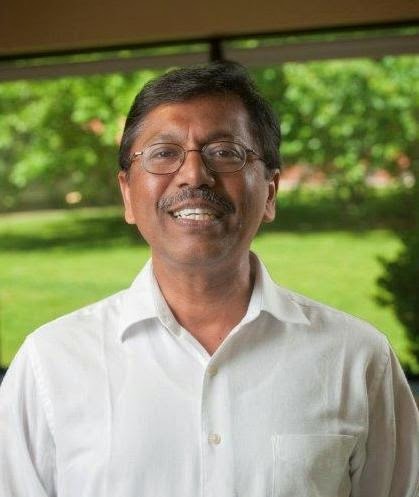 He is an acclaimed author of six books on his native country that have helped us immensely in our understanding of the complex political landscape of modern Myanmar. This book – a translated work – is an excellent source to understand the very treasure trove from which the ex-generals reportedly drew their inspiration to ruling the country. After all, in 1990, Sr. Gen. Saw Maung, the military ruler of the country at the time (who reportedly believed himself to be the reincarnation of a 11th-century warrior-king), famously said that he would rule the country according to Laukathara. As Dr. Maung shows, Laukathara – a popular literary work – provides the cultural fabrics of Myanmarism – an ideology in which religion and race mingle to define how Buddhists in Myanmar should behave and conduct their affairs from a layman to the ruler. Literally, the phrase Laukathara means the essence of the world. Written originally on palm leaves with the Rakhine phonetics, it was taught by a Rakhine monk by the name of Thu Mrat of Theravada Buddhism in the early 14th century. He was the teacher of King Mun Hti (Laung Krut dynasty) who had entrusted him with the education of three princes of the Thet (or Chakma) king Lyin Saw. The latter had lost his kingdom (Thayet or Thet Yet) – located near central/lower Burma – in 1333 CE to the Rakhine King Mun Hti. Later Laukathara reached Myanmar from Arakan and became a royal handbook of administrative philosophy – very much like what The Prince of Niccolo Machiavelli (16th century Italian) had become in Europe to guide its rulers. It has been a guiding source of law and order, rules and regulations, ethics and philosophy, and traditions and culture in Myanmar society. It essentially constitutes the prima materia of Myanmar’s Buddhist culture, or perhaps, more correctly, the Buddhist political theology – based on the Buddha, the Dhamma (religion) and the Sangha (community). It is a very popular literary work with many Buddhists in the country growing up with it. The SLORC chairman Sr. General Saw Maung, a devout Buddhist, promoted Laukathara in Myanmar administration, a trend that was to continue by his successors. Essentially it defined Myanmarism. The traditional Myanmarism has been Buddhism and militarism since the days of King Anawrahta (ca. 1044-1077 C.E.). In the hands of military rulers of our time, the new Myanmarism became a toxic cocktail of ultra-nationalism and religious fanaticism (or religio-racial ultra-nationalism, as coined by Dr. Shahnawaz Khan). If the old one regressed from the teachings of Buddha – being often violent and ugly, the new Myanmarism revealed itself to be brutal, dirtier and uglier. In this, the ends justified the means; lies and deceptions became all too natural and acceptable strategies to rule and govern a Buddhist majority country like Burma. It turned out to be a feudal recipe for disaster, which shunned pluralism, diversity, and multi-culture – the very trend-setters for progress in our time. Mixing of religion in politics in our time has often seen the devastating consequences of how such otherwise good religious teachings can become weapons in the hands of ‘cherry-picking zealots’ to ethnically cleanse the ‘others’ who are different. The 1982 Citizenship Law thus provided the very justification for the Myanmar regime towards the elimination of the minority races like the Rohingya. It was no accident that Myanmar had witnessed, since 2012, a series of genocidal pogroms, mostly directed against the minority Rohingya and other Muslims. The terrorist monk Wirathu, who heads the fascist organization Ma Ba Tha, became the Buddhist face of terrorism, xenophobia, intolerance, and hatred. In the name of protecting Buddhism nearly a quarter million of Muslims were violently displaced from their homes all across Myanmar; many were killed, and others forced out of the country. The eliminationist policy – endorsed from the top and preached and justified by Buddhist monks – became THE national project inside Myanmar, enjoying moral and material support at every level of the Buddhist society. So powerful was the influence of Wirathu and Ma Ba Tha that four controversial race and religion bills were signed into law by President Thein Sein to heighten the racial and religious tensions further. Succinctly put, the teachings of Laukathara became the eliminationist policy – adopted by the military governments. However, as one reads the translated work of Dr. Maung, it was not meant to be such. For any westerner interested to understand the very driving force behind the moral imperative (if any) of the rule by the ex-generals of Myanmar, who saw themselves as the reincarnations of King Anawrahta, this translated work of Dr. Maung is a must. I recommend it wholeheartedly.